Welcome to shopping from our store . 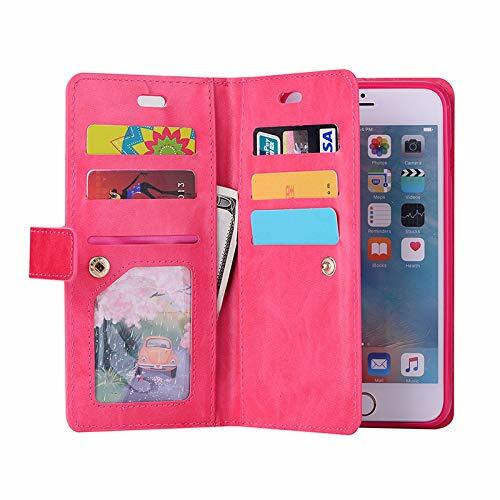 Looking for Fashion wallet case for a gift or for yourself ? We make sure provide all hig quality products. All Sammid products have been strictly inspected before shipping to ensure that all products are in good condition. Made of durable Soft PU leather to prevent scratches. It is durable,slim, comfortable,lightweight . Lightweight case design protects your phone without adding bulk,easy to carry. Simple but meet your needs. Easy to install and remove your phone. - Due to lighting effects, monitor's brightness/contrast settings, etc., there could be some differences in the color tone of the pictures and the real item. If any question ,please kindly contact us . Designed for 2018 6.2 inch Samsung Galaxy S9 Plus .Please kindly check your phone modle before purchase. Perfect combination of purse and mobile phone case.You can carry the phone case with your wallet or you can take it out of the wallet if you just want to carry the phone without the purse. High qulaity Luxury PU leather Built-in TPU case firmly grasps your phone ,provide full body protection for your phone case.also have hand free stand function. Unique Card slot design allows you to carry your cards and money easily and conveniently. Precision cut-outs for all ports, access to all controls and functions without removing the case.If any quality problems ,feel free contact us ,we will give all refund to you. If you have any questions about this product by Sammid, contact us by completing and submitting the form below. If you are looking for a specif part number, please include it with your message.